Mumbai, Maharashtra, India: If there is one heroic character from literature that doesn’t seem to sink into oblivion, it is the legendary John Galt from Ayn Rand’s epic novel – Atlas Shrugged. Ever since the book was published in 1957, many real life icons in modern day society have been equated to the legend over the years. In his latest book ‘The Target’, Shantanu Guha Ray, has also drawn parallels between his protagonist Jignesh Shah and John Galt. So what makes the 1950s hero such an enduring character? Finding immense similarities between the two, Guha says, Galt’s philosophy of objectivism resonated heavily with Shah’s. Both championed the pursuit of rational self-interest that would ultimately lead to collective glory. Like all heroes, they have had to fight against a mediocre economic and social structure that tries to strangulate innovative individuals striving for excellence. Even, the famed ‘Wright brothers’ credited with inventing, building and flying the world’s first successful airplane, did not have it easy. Skeptics in the US government and military were initially apprehensive of their invention and one magazine even called them “Lying Brothers”. The ingenious technologies introduced by Jignesh Shah’s organisation Financial Technologies went on to disrupt our financial markets. Shah’s fierce ambition and perseverance catapulted him to the pinnacle of stardom. He went on to create 10 world-class exchanges within 10 years. Despite many hurdles placed by his rivals in his path, Shah believes that a corrupt system cannot deter his spirit of innovation and heroes like him will emerge as winners. Our world needs more icons like Shah who have the power to rewrite history. Shantanu has done a great job of bringing to life John Galt through Jignesh Shah. 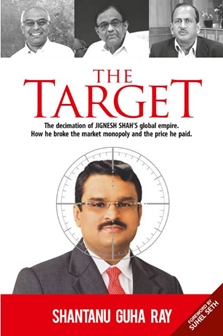 Shantanu Guha Ray's 'The Target' delves into the conspiracies in the finance sector which resulted in the downfall of the Czar of Exchanges, Jignesh Shah. The spirit of innovation of Shah has been compared to the legendary John Galt from Ayn Rand's epic novel – Atlas Shrugged. The immense similarities between these two real life icons who strive for excellence even in the midst of corrupt systems.